You’re busy. Whether you work full-time, attend college, care for a loved one, run a household—or all of the above—you don’t always have time to make yourself nutritious meals. Like many people who want to eat healthy on a budget, you probably rely on those handy frozen entrees to fill the gap. After all, they seem like a bargain compared to going out for lunch every day. But if you do the math, you’re probably spending at least $60 per month for frozen meals that don’t taste that great and are processed, packaged, and preserved. Why not make your own frozen dinners and save the extra money? By using better quality ingredients and controlling the cooking method, you’ll always have a supply of quick and tasty meals on hand—foods you actually like to eat! Healthier. Many commercially-prepared foods are full of salt, artificial ingredients, preservatives and unhealthy fats. By making your own meals, you can control what goes into them and use quality ingredients like brown rice instead of white rice, organic vegetables instead of conventional, and olive oil instead of palm oil. Inexpensive. While a frozen meal may be cheaper than a restaurant bill, it’s still more expensive than cooking from scratch. If you prepare your own meals with whole ingredients, you can save $100 a month or more. Time Savers. Making your own meals doesn’t have to be time-consuming. Set aside one day a month to cook a few recipes and you will have enough meals to last for weeks on end. You can even make cooking a social event by inviting some friends and sharing recipes—you’ll get to try something new while you chitchat with your buddies. Eco-Friendly. Frozen entrees are packed in plastic and cardboard that usually ends up in landfills. When you make and package your own foods, you can decrease your impact on the planet by using glass or plastic containers over and over again with little to no waste. Full of Variety. Prepackaged frozen meals don’t offer any flexibility—what you buy is what you get. While you might like some of the ingredients in the meal, not everything is going to appeal to you. But by creating your own, everything will be up to your taste level and standards—and you can change the menu, ingredients, and combinations any time! The choice is yours. Preparing freezer-ready meals isn’t a difficult task. To get started, use these meal-preparation and storage tips. The containers you use to store your meals in should be both microwave- and freezer-safe. Both glass and plastic may work well, if they meet these standards (all glass and plastic containers are different). Another option is large freezer bags. Certain foods will freeze well in a bag, and can then be defrosted in the refrigerator, placed in a microwave-safe container, and then reheated. Before portioning out cooked food into containers, allow it to cool completely first and always leave extra room at the top of to allow for expansion of the food during freezing. Make sure food is wrapped well and/or covered with air-tight lids to prevent air from getting in. Foods with high moisture content (such as soups) tend to freeze better than drier foods. Don’t turn your food into a mystery science project. Use a permanent marker to label each dish with a name and a date. For maximum quality and flavor, use each meal within a couple of weeks. Just like in a store, rotate your stock so that the newest meals are in the back and the oldest are in the front for easy access. Vegetables should be slightly undercooked to prevent them from becoming mushy when you reheat them. Be careful about bacterial contamination. Completely cool hot food before freezing it to prevent the growth of bacteria. Bacteria can grow when the outside of food freezes while the inside remains warm. If you’re not sure a meal will freeze well, cook and freeze only a small portion the first time. If the quality is okay, then go ahead and freeze more in the future. Read your owner’s manual to find the fill level that will keep your freezer running at peak energy efficiency. Certain freezers run best when completely full, while others shouldn’t be filled more than half-way. 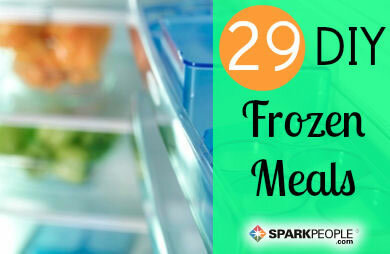 Consider posting a freezer inventory list nearby to track the meals (and dates) of everything in the freezer. Check off each item as you remove it and you will know exactly what foods are available at all times. This also prevents forgotten foods from going to waste. Don’t re-freeze defrosted foods because the taste and texture will decline and you could be risking bacterial contamination. As a general rule, the following dishes tend to freeze well: baked goods, burgers (sometimes uncooked will freeze better), burritos, calzones, casseroles, cooked beans, cooked grains, egg rolls, enchiladas, French toast, quiche, lasagna, manicotti, mashed potatoes, meatballs and meatloaf, pancakes, pot pies, poultry, roasted meats, sauces, sloppy Joes, soup, stuffed shells, taco fillings, tofu, TVP, and waffles. Foods that do NOT freeze well include: egg- and cream-based sauces, instant rice, salad, stuffed poultry, hard-cooked eggs and fried foods. If you’re ready to start making your own frozen dinners, here are a few healthy SparkPeople recipes to get you started with flair!